A coordinate is a group design object. It is used to mark the X (horizontal) and Y (vertical) distance of a point in the design workspace relative to the current origin. Coordinates can be placed on any layer. 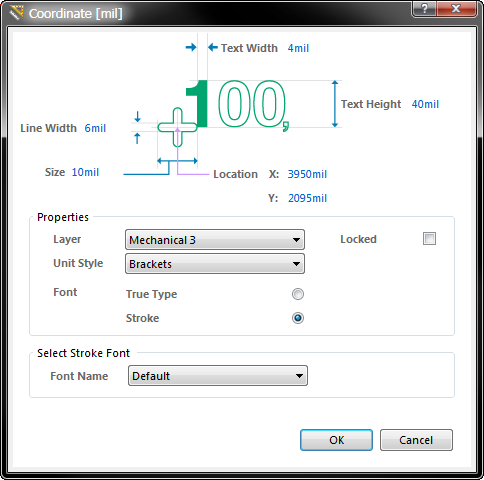 Position the cursor and click or press Enter to place a coordinate. Continue placing further coordinates, or right-click or press Esc to exit placement mode. Press the L key to flip the coordinate to the other side of the board. Press the Tab key to access an associated properties dialog, from where properties for the coordinate can be changed on-the-fly. Click anywhere on the coordinate and drag to reposition it. The position values are automatically updated as the coordinate is moved. This method of editing uses the Coordinate dialog to modify the properties of a coordinate object. The Coordinate dialog can be accessed prior to entering placement mode, from the PCB Editor – Defaults page of the Preferences dialog. This allows the default properties for the coordinate object to be changed, which will be applied when placing subsequent coordinates. Double-clicking on the placed coordinate object. Placing the cursor over the coordinate object, right-clicking and choosing Properties from the context menu. The current origin can be set to be any point in the PCB workspace by selecting Home | Grids and Units | Origin » Set, and clicking on the location for the new origin. To set the current origin back to the absolute origin ((0,0) in the lower-left corner of the workspace), select Home | Grids and Units | Origin » Reset.